Ralph Northam, the Democratic governor of Virginia who was elected a year ago largely because of the fallout from the racist rally in Charlottesville, is in hot water over a recently unearthed photo of him when he was 25. In the photo are two smiling people in costumes: one dressed in blackface and the other in a KKK robe. 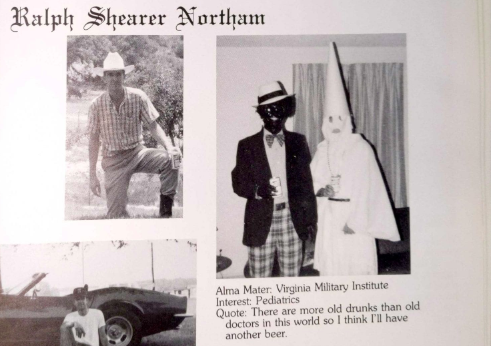 Northam has acknowledged the photo is real, and that yup, that’s him. (The photo appears on his page in his medical school yearbook, so the chances the photo wasn’t authentic were pretty slim). The question now gripping American politics is, Should Ralph Northam resign? Dude. It’s a picture of you in blackface. Resign. The Florida Secretary of State recently resigned after photos surfaced of him dressed not just in blackface, but as a Hurricane Katrina victim. That photo was taken in 2005. There’s no way this single photo is the only one that exists. Quit now and check the bloodthirsty right wing media trolls who are right now scouring every cranny of your past for more damning evidence. If you don’t, you’ll give Donald Trump something really stupid to talk about in his State of the Union address next week. Given the way that so many formerly closeted racists in this country now feel free to express their racism out in the open thanks to the rhetoric and actions of this President, the Democratic party must maintain a zero-tolerance policy for this kind of behavior. If he were to step down as Governor, that would elevate his Luitenant Governor to the role. And the current Lt. Governor of Virginia is Justin Fairfax, a popular black politician. Northam has a strong legislative record of advocating policies like police reform and a $15 minimum wage, all of which would meaningfully benefit the black community. Some argue this is more important than a single photo from 35 years ago. Blackface is a mere symbol of racism that we are in danger of fetishizing. People who hold this view encourage us to focus instead on policies. This as an opportunity for civil rights groups to “get something big” from Northam, in exchange for “allowing” him to stay. He should listen to only the people of Virginia, as he makes his decision. In 1984, especially in Virginia, racially insensitive attitudes were still the mainstream. Plenty of “good white people” still thought the Dukes of Hazard was normal, and certainly wouldn’t have been bothered by blackface and KKK costumes. This reason gives Northam the benefit of the doubt that he could very well have held the strong progressive values he espouses today, while nonetheless allowing himself to get swept up by his peers in a bad choice for a costume. In his statement (which was followed by a video), he did everything right: he apologized, he acknowledged the harm he had caused, and he specifically said he’s ready to “do the important work” of “healing the damage this conduct has caused.” Shouldn’t we give him a chance to make this right?? But the much more important question to me is, What meaning will people attach to his decision? Or, what will Northam’s decision add to the debate currently raging in this country about how to deal with the misconduct of our past? We as a country – but also as communities within this country – need to adopt the principles of transformative justice, if we are to ever stop bludgeoning one another over wrongful past deeds. Determination of truth. What actually happened? Not necessarily what can be proven beyond a shadow of a doubt, but what’s the actual Truth that exists? Acceptance of responsibility. The opposite of blame, in which we point the finger at others, personal responsibility is when we turn that finger around and acknowledge our own role. Reparations. While stating the truth and taking responsibility for the harm that’s been done can go a long way in the healing process, sometimes it’s not enough. Reparations seeks to compensate survivors, or make them as whole as possible. Punishment. Sometimes mere reparations isn’t enough. Sometimes people who have acted badly simply must be punished, in order for justice to be served. Commitment to be better. This applies to both individuals and systems. Systems that allowed abuse to happen must be reformed, and individuals who did bad things must promise to do better in the future. Accountability for actions that demonstrate that “better” behavior. Words and even commitments are empty, unless they’re followed up with meaningful action that can be measured and tracked. Forgiveness. People who have been wronged must ultimately let it go. Mostly for their own benefit; but also because the wrongdoer who has successfully committed to a path of redemption deserves it. What Does All This Mean for Northam? In the case of Northam and the current scandal, steps 1 and 2 have been handled. The truth of the situation was pretty well established when he confirmed the photo was real, and he took responsibility in his statement. Or … are those 2 steps done?? We don’t yet have the full truth of what happened. Because while the photo is hurtful and insensitive, it’s not the full story. Knowing that the photo is real isn’t the whole Truth. What people still want to know is, WHY did Ralph Northam pose for that photo? Was it peer pressure he was immediately sorry for, or did he in fact at the time think it was funny and appropriate? While Northam’s statement included the words “I’m sorry,” and did acknowledge that his actions harmed people, what he didn’t do is explain how he supposedly transformed from a 25 year old who thought a costume like that was a good idea into a 59 year old who expects us to believe his stated progressive values are sincere. What this also means is that while Northam appears to have sewn up #5 Commitment to be Better and #6 Accountability for Better Actions, there’s a gap there. We’re left with a hollow in the pit of our stomach, that place where we aren’t quite sure we can actually trust him. Which leaves us with the question, what should Ralph Northam’s consequences be? What should happen to him as the result of his misconduct? At this point, I can’t say that definitively because we don’t have enough information. Will Northam hear the calls from people who want him to fill in the gap? Will he explain how he got from being a 25 year old in blackface to a 59 year old progressive, in a way that will be convincing? And finally, how will he respond to this scandal more broadly? While his legislative record does give him a lot in the “Demonstrates better behavior” column, all that could get wiped away if he proves to not be up to the task of navigating this scandal.